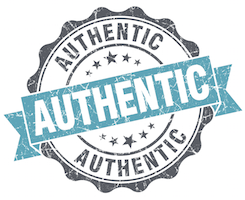 One of the most difficult aspects of blogging for many marketing writers is writing in an authentic voice. This is especially true for busy B&B innkeepers, who have a hard enough time sticking to a consistent publishing schedule without worrying about how to craft their blog posts to come off as “the real deal.” Explore these “do and don’t” blog writing tips to discover how your improve your writing for readers, make it ring true to them, and earn more conversions. “Fortune favors the bold,” but why? People respond, positively or negatively, to bold declarative statements. Your job as a marketing blogger is to find those statement that will receive positive response from the higher percentage of visitors from your target audience. One of the biggest mistakes made by marketing bloggers is blogging for search engine visibility exclusively. Doing this may result in visits via organic (i.e. unpaid search) but the visits will tend to be of lower quality (higher bounce rate, fewer conversions, etc.) because the visitor finds nothing insightful or helpful in the post. The point of your post should be to provide insight into its topic. It’s not enough to describe your post subject (such as a local attraction or activity) – you must provide insight about it as a writer. Insight about the topic of a post should be supported by subjective opinion about it. You’re not a reporter. You’re writing to earn reader interest and your opinion is a effective way to get there. In general, it’s better to avoid writing that takes on the passive voice when composing a marketing piece. The difference between active and passive verbs is simple. Passive voice: The guided tour was led by the park ranger. Active voice: The park ranger led the guided tour. The latter makes a bolder statement simply by placing the emphasis on the subject performing the action. This cannot be stressed enough: do not attempt to make the work of others appear as you own. Only use images that you have permission to use and credit as appropriate to that permission. “When in doubt leave it out” should be your guideline if you can’t verify a quote or you don’t know the permissions status of an image. Read more about this subject in my post Plagiarism: Illegal, Unethical…and Devastating to Your Google Search Rank. “Make everything as simple as possible, but no simpler,” is an elegant summation of your goal. The idea is to provide enough content to establish and support the subject of your post to entice conversion by the reader, whether its a click-through to other content, downloading a file, making a comment, sharing the post in social media, or contacting you. Whatever your topic, be sure you address the point of it in the introduction and then provide the “scenic route” to it within the rest of your post. The best piece of advice you will ever get on this subject is this: always assume that the reader’s time is more valuable than your own. Even if that statement isn’t factually true, it is how the reader will see it. Making smart word choices and cutting out as much bulk as you can will go a long way to keeping readers interested. Industry-specific buzzwords make readers see you as arrogant, rather than smart. Avoid jargon unless you can teach the reader the definitions organically as part of the post. Write out organization names in full the first time they are used and follow with the acronym in parentheses unless the acronym is widely known. A weasel word is a word or phrase that attempts to create the feeling that a meaningful declaration has been made when, in reality, the claim is actually ambiguous. Avoid vague expressions, such as “many people” or “experts.” Steer clear of adverbs that avoid specifics, such as “often.” Stay away from euphemisms. And don’t use passive voice, as noted above. Follow these blog writing tips to help you improve your blog’s inbound marketing efforts.